More than a century ago, the first aviation pioneers figured out a way to use rigid wings with flaps to generate enough force to lift a heavy craft into the sky. It was one of the great advances in human history and also the beginning of a new era in transportation. Airplanes, and the airline industry that depends on them, are now among the world’s largest businesses, with air travel producing over US $700 billion in annual revenues. However, commercial airlines spend more than 25 percent [pdf] of their operating expenses on fuel, earning the industry a reputation for razor-thin margins that will eke out just $39 billion [pdf] in profits this year. Meanwhile, modern aircraft wings and engines have reached near-peak levels of efficiency, making it exceedingly difficult for engineers to generate additional savings. And yet, there is one promising strategy that remains—changing the shape of the aircraft wing during flight. For three decades, engineers at aerospace companies, universities, and defense labs have been working on twistable aircraft wings that could be instantaneously and minutely adjusted to improve fuel efficiency. With these wings, aircraft designers could get closer to optimal performance by increasing an airplane’s lift-to-drag ratio, which is a measure of aerodynamic efficiency, in response to variations in speed, altitude, air temperature, and other flight conditions. This modern pursuit has a notable historical precedent. Way back in 1905, Orville Wright steered the brothers’ pioneering airplane by lying prone in a saddle and twisting the tips of the plane’s fabric-and-wood wings with a sway of his hips. Soon after, as aircraft became heavier, engineers switched to stiff wings controlled by rigid flaps and ailerons, and morphing these surfaces proved impractical. Decades later, in the mid-1980s, the U.S. Air Force tested Mission Adaptive Wings that were built by Boeing and installed on an F-111 aircraft. An automated control system reshaped the thin outer covering of these wings to change their curvature, thereby reducing drag by up to 20 percent, for supersonic flight. Unfortunately, the added weight and power demands of this technology made the aircraft less efficient overall. 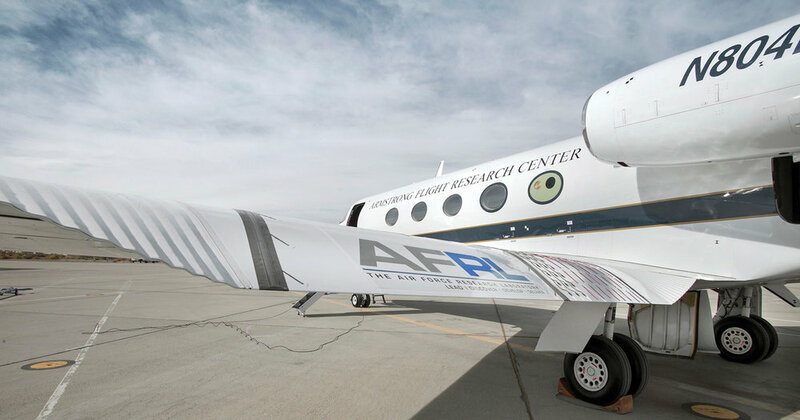 From 1996 to 2005, the U.S. Air Force collaborated with NASA to develop an Active Aeroelastic Wing, which used the power of the airstream to twist itself for better roll control during high-speed maneuvers. But that technology was intended only for fighter jets, and the program eventually lost support. The flexible wing concept has matured greatly since then. My colleagues and I have built a shape-changing control surface that in recent tests, conducted with the technology installed in place of traditional flaps on the wings of a Gulfstream III jet, reduced drag to a degree that could improve airplanes’ fuel efficiency by up to 12 percent. The flexible surface adjusted the curvature of the wings’ trailing edges to deliver an optimal lift-to-drag ratio throughout the test flights, whereas flaps on today’s airplanes pivot to generate lift or drag only during takeoffs and landings. In addition to saving fuel, analyses by NASA and other researchers have shown that this surface could also lead to quieter landings and possibly even less turbulent flights.